In a world of constant communication, we seem to leave a lot of things unsaid. We send hundreds of messages every day, but how often do we say what we actually feel? How often to we share what we’re really thinking? 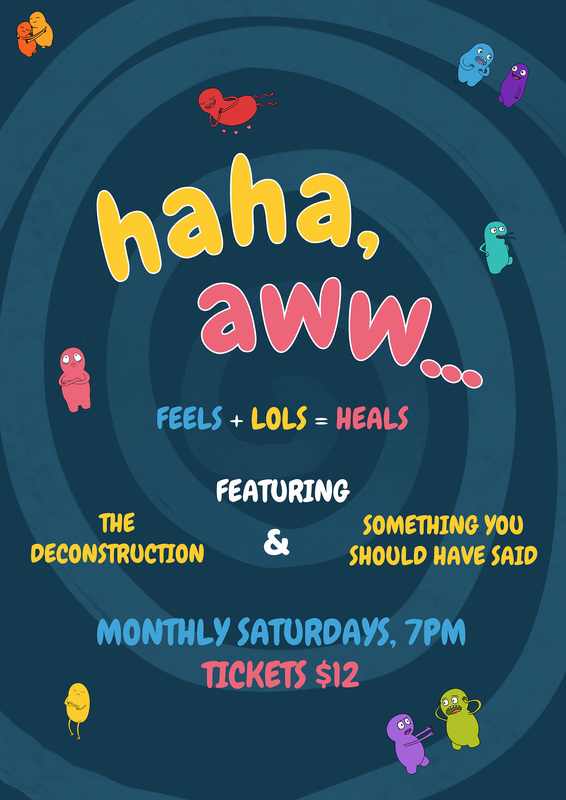 ‘haha aww...’ is a celebration of communication breakdowns. You probably spend hours ruminating on your faux pas, regrets, silence, missteps... so why not spend an hour laughing at the complicated, confusing, comedic conversations and circumstances we all create as we attempt to co-exist!! "Something you should have said"
A celebration of regret, an exorcism of the unsaid, and an exploration of the rules of human relationships. Audiences inspire this show; come early to write down the things you should have said and see the brilliant cast of Hindsite live the moments you could’ve lived if you said the things you should’ve said. A long form improv format created by The Family under the direction of Del Close. It intertwines grounded and comedic improv to examine the moments that pull apart and bring together a relationship between two people. It gets real. Get ready for feels. Cross your fingers for heals.